There are so many reasons to eat healthy whether it’s for physical, mental, emotional health, to be a good role model for your kids or to reduce your risk of developing a diet related disease. I eat healthy because it helps me feel my best so I can give my best to my job, relationships and enjoy life to the fullest. I also love that a healthy diet is a great way to support both short-term and long-term health. What is your why? Why do you eat right? Today I’m sharing how to make a dessert that is so delicious and equally packed with nourishing ingredients. We’re making Chocolate Prune Cupcakes which are sweet, flavorful and even have fiber! Two ingredients that may surprise you in this recipe are prunes and prune juice! 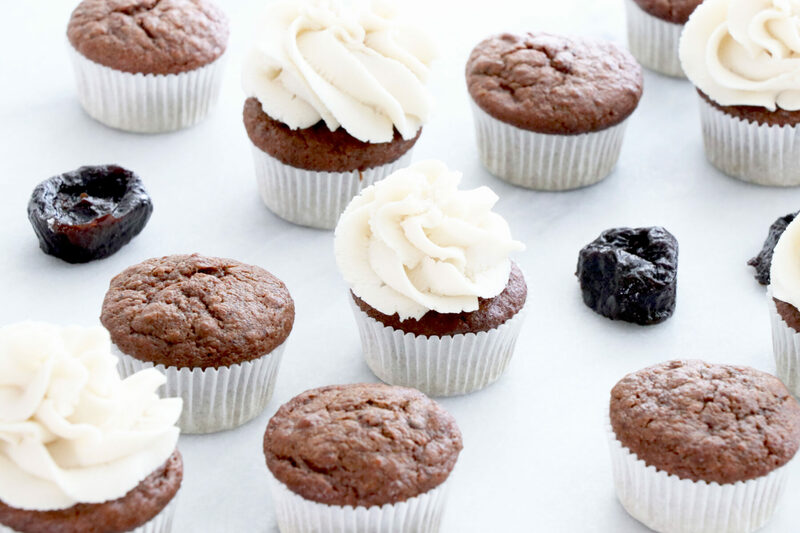 Prunes add fiber, natural sweetness and give these cupcakes a soft, moist texture. Sunsweet Amaz!n Prune Juice can also help you balance and maintain good digestive health to help you feel your best. Sunsweet Amaz!n Prunes are The Feel Good Fruit! They are a delicious, convenient nutrient dense snack. Did you know that prunes even help support bone health? Research suggests that eating 5-6 prunes each day may help to prevent bone loss.